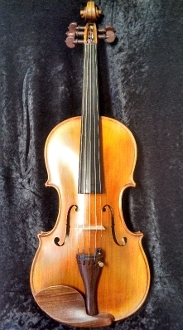 This unique 5 string violin for sale was made in China for import to the US by West Coast Strings. It is labeled Peter Kauffman. As a 5 string violin, it has a slightly larger pegbox than a standard full size violin. The body length is a standard 14". 5 string violins are popular with jazz players or fiddlers who are looking for a bigger range in notes and sound; the extra C string allows this violin to accommodate all viola music. This Kauffman 5-String Violin was made in 2010 and is new without repairs. The tone is moderate; neither too bright nor too dark. The wood is good and the golden-orange varnish is nice. For $1400.00, this 5 string violin would be a good choice for any player looking for a casual 5 string instrument.